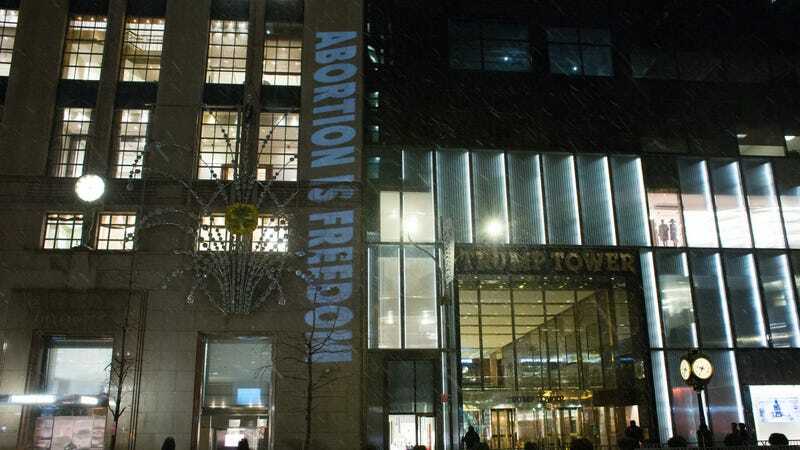 After yesterday’s third annual Women’s March and the recent March for Life in Washington, D.C., Shout Your Abortion and The Illuminator collective projected a series of messages and facts about abortion onto both Trump Tower and a Union Square building in NYC. Cofounded by Amelia Bonow, Kimberly Morrison, and former Jezebel staffer Lindy West, Shout Your Abortion began in 2015 as a social media campaign designed to remove the stigma around abortion. Since then, it’s become a “grassroots movement” that seeks to enable people to share their abortion stories through art, media, and community events. This post has been updated to include The Illuminator.